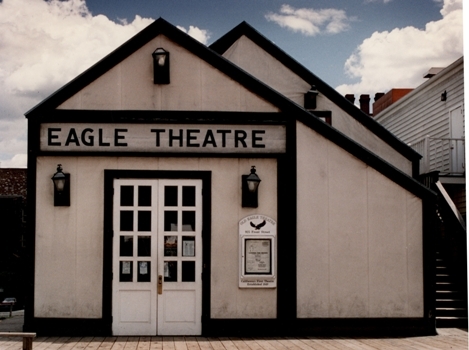 The Eagle Theatre is a reconstruction of the first building erected in California as a theater. The original playhouse, built of wood frame and canvas, with a tin roof, provided Gold Rush Sacramentans with entertainment for a mere three months before being inundated in the flood of January 4, 1850. Today, the Theatre offers docent and video programs on the history of Old Sacramento to grades 4 through 6 school groups on a reservation basis. If you're a fan (even only casually) of western history, you know that the 1848 discovery of gold at Sutter's Mill led to quick and drastic changes that have profoundly affected California. Less well known is the fact that one of Old Sacramento's best-known Gold Rush-era structures the historic Eagle Theatre operates under the stewardship of the California State Railroad Museum. But what do the Railroad Museum and this early Sacramento landmark have in common? How does the Theatre support CSRM's mission and institutional goals? Let's journey back in time now to find these and other answers. Sacramento City, spring 1849. Located along the eastern bank of the Sacramento River about 500 feet south of its confluence with the American River, this was the gateway to the gold fields. First mapped in 1848, this waterfront settlement became a bustling tent city overnight. Peopled by hordes of immigrants from all over the world, it must have been a tumultuous place indeed. Most of Sacramento's temporary residents undoubtedly had visions of vast, immediate fortune. Nearly all had arrived by sailing ships which slowly made their way up Sacramento Delta waterways from the port city of Yerba Buena soon to be renamed San Francisco. They came to town only to pause for a short while, re-equipping themselves for the next part of the journey before moving on. Little work would be required to strike it rich, they dreamed; gold nuggets would simply be waiting to be harvested from the riverbeds of the nearby Sierra Nevada foothills. By July 1849, more than 2,000 could be counted as at least transient inhabitants of the "tent and board city." Of the general bedlam, the local Placer Times newspaper observed "Goods for which there is no shelter, strewn along the banks; others stored in tents or under old sails, for the scarcity of building material gives rise to a variety of queer substitutes." Numerous "diversions" quickly sprang up to satisfy the demands of the nearly all-male population of gold seekers and assorted adventures. Among the earliest of these was the "Round Tent Saloon," erected near the corner of Embarcadero (Front) and "J" Streets in late spring 1849 by Zadock Hubbard and his partners Gates Brown and Madison Pruett. This not only proved immediately successful as a "watering hole" and gambling establishment, but also as the budding settlement's prime location to exchange gold dust and nuggets for U.S. coins. Paper money was not popular at the time due to a number of drawbacks; not only was it perceived as having less "value" than the hard metal of coins, but also it was prone to destruction in fire and more difficult to carry. Soon enough, gambling and imbibing were found not to be sufficiently amusing for Sacramento's constantly changing populace. Perhaps this was due simply to the near-absolute lack of entertainment in the gold fields, but in any case an important addition to the Round Tent Saloon was soon underway: the Eagle Theatre. Construction began in July 1849 on what would become California's first permanent theater and what the editor of the Placer Times would later refer to as "This oasis in a great desert of the mind." Opening on September 25 of that year, the Theatre's initial offering featured a hastily-arranged group from San Francisco and Stockton performing a minstrel show. "Tickets may be procured at the saloon in front of the theater," stated a note in the opening night's program, referring most likely to the Round Tent Saloon located just outside and to the south of the Eagle Theatre. Although many details regarding the original structure today remain in doubt, published illustrations, personal accounts, and latter-day recollections of the Theatre are quite telling about life in the Gold Rush. Scarcity of both building materials and labor are evidenced by the original structure's $30,000-plus cost this for a wood-framed, canvas-covered structure with a tin roof, and probably a hard-packed dirt floor! Although the depth of the building remains disputed today, historical accounts and archaeology confirm a width of 30 feet. Historians agree that discrepancies regarding the building's length are likely rooted in the Eagle Theatre's constantly-evolving nature, as are other contradictory accounts of building details. EAGLE THEATRE-This house opened on Thursday evening to a full, and we may add, fashionable house, for the "dress circle" was graced by quite a number of fine looking well-costumed ladies, the sight of whom was somewhat revivifying. Of the performances we have no room to speak in detail, nor to point out many imperfections, which we have no doubt will be corrected after a few representations. Messrs. Hubbard, Brown & Co. deserve the patronage of the theater-going public for building such a comfortable and well-arranged house. According to contemporary accounts, the auditorium was a small space, sharing a common wall at the back with a saloon (presumably the saloon was added directly to the Theatre's front when the Round Tent Saloon was moved to make way for a new building next door). Seats were rough boards, apparently without seat-backs and possibly sitting atop tree stumps or packing crates. General lighting was provided by three multi-candle chandeliers, while stage lighting most likely was achieved with oil lamps placed directly in front of the stage. Entrance was through the saloon although visiting ladies and genteel men could be spared the indignity of passing through this rowdy space by sitting in the "boxtier" gallery (loosely akin to a balcony), accessed via an outdoor ladder staircase next to the main entrance. For all its colorful performances and primitive appointments, the Eagle Theatre went through four bankruptcies and three changes of ownership in less than three months plus a couple of major remodelings. Finally, a violent wind and rain storm closed the theater in mid-performance on January 4, 1850. It would not reopen at the same location; flooding of Sacramento that month exacted a heavy toll on the entire waterfront area, leaving only a portion of the theater's framework intact. New owners chose to relocate approximately 200 feet to the east, with the front of their new enterprise, renamed the "Tehama Theater," now facing onto Second Street. Over the next six decades, at least 23 different live entertainment venues would grace downtown Sacramento in the Front Street-12th Street corridor. Well over a century after the Eagle Theatre's demise, the old waterfront district Sacramento's "skid row" was proposed for redevelopment into what we know today as Old Sacramento. By the early 1970s the area was buzzing with activity, with structural repairs under way to a number of historic buildings, and many years' worth of fasade remodelings in the process of removal. Construction of Interstate 5 was imminent and what would become known as the California State Railroad Museum was under consideration. Following production of an interest-generating film and a study/recommendation pamphlet entitled Old Sacramento-1849 Scene by the Junior League of Sacramento and the Sacramento Historic Landmarks Commission, the Junior League in 1972 contracted with the Central California Archaeological Foundation to study the original Eagle Theatre's site. The California Department of Parks and Recreation (DPR) subsequently awarded a concession contract to the Junior League, allowing it to raise funds and assist in reconstruction of the Eagle Theatre. Plans called for this to be one of a number of reconstructions in the new Old Sacramento State Historic Park (also referred to as the "1849 Scene"). Over the next two years, Junior League members raised funds, conducted additional historic research and assisted in site excavation. The state legislature in its 1973-1974 session appropriated $75,000 toward the reconstruction project. Total costs for the 4,890 square foot facility were approximately $260,000, with most of this figure coming from donations and fundraising events spearheaded by the Junior League. Reconstruction was complete by early 1974; the first performance, presented on March 14, was appropriately an 1845 patriotic comedy entitled Fashion. Shortly before the theater's opening, the non-profit "Old Eagle Theatre, Inc." was established by the Junior League to operate the theater. The first two years' operating capital was supplied by the League, after which time the corporation was expected to become self-supporting. Unfortunately this proved hard to do, and 1986 was the final year that Old Eagle Theatre, Inc. operated the venue. A contract was then signed with the established Chataqua Playhouse, which presented live performances and children shows for two seasons beginning in 1987. That same year City of the Plain, a 13-minute narrated slide show about Sacramento's history, was developed. A series of concessionaires were subsequently contracted by DPR to operate the Eagle Theatre. After several years of declining attendance and severe DPR staffing limitations from 1993 to 1995, the last of these contracts was not renewed. And so in 1996, as part of an overall restructuring related to Old Sacramento State Historic Park, the California State Railroad Museum assumed operation and staffing of the Eagle Theatre. Although "Old" is no longer part of the title, the Eagle Theatre today presents School Field Trip Opportunities and a number of community events utilize the theater in conjunction with other activities. For instance, youth bands often perform there during the annual Sacramento Jazz Jubilee, historical tours and programs originate there during Old Sacramento's annual "Gold Rush Days" event over Labor Day Weekend, and live puppet shows have entertained audiences during Old Sacramento's annual "Heritage Holidays" event in late November and December. So, what do the Eagle Theatre and the California State Railroad Museum have in common? To begin with, there are powerful historical and cultural ties between railroading and Sacramento's earliest days. Although the reconstructed Eagle Theatre is set in an 1849-1850 timeframe, it was just two years later that the state's first railroad line, the Sacramento Valley Rail Road, began building from Sacramento's waterfront to Folsom. There are also a number of practical advantages proximity, business management, and organizational talent that have been brought to the theater's operation by the Railroad Museum and its non-profit Foundation. Sacramento's central role in the transportation schemes of California and thus its prominence as a cultural and performing arts center was assured just over a decade later, when the Central Pacific Railroad began construction on the western portion of the nation's first transcontinental railroad. In its exhibits and orientation film, the California State Railroad Museum celebrates early-day Sacramento's role in helping the Golden State to become the worldwide trade and commerce leader it is today. With the renewed interest in history in general and California's Gold Rush, Sacramento and particularly Old Sacrament will be taking on renewed importance. The recently revived, annual "Gold Rush Days" event scheduled each Labor Day Weekend in Old Sacramento has added additional momentum. After all, this was the jumping-off point for those gold fields; Sacramento soon became the business and cultural hub for the Mother Lode and its thousands of gold seekers. Today, both the California State Railroad Museum and the Eagle Theatre celebrate the heritage of California's capital city and the role it has played in the state's growth and development. The coming years should be busy ones for this unique Gold Rush-era performing arts venue. With the dawning of a new millennium, the reconstructed Eagle Theatre operated today by the California State Railroad Museum, with additional funding provided by the CSRM Foundation has a bright future indeed.